Rene Paredes kicked five field goals and the Calgary Stampeders set a CFL record for wins over divisional opponents in their 15-9 victory over the Saskatchewan Roughriders on Sunday. Charleston Hughes wanted to remind the Saskatchewan Roughriders who runs the show in the CFL's West Division. The outspoken Hughes didn't mince words following his team's 15-9 victory over the host Riders on Sunday. "Not only do we have the most dominant front four in the league, our backup defensive linemen are making just as many plays as the starters and we had our way with [Saskatchewan] today," Hughes said after a dominant defensive showing on the Riders' home turf. The Calgary defensive unit, led by Hughes and Ja'Gared Davis, registered five sacks, an interception at the goal line and a forced fumble that came late in the fourth quarter to secure the victory. 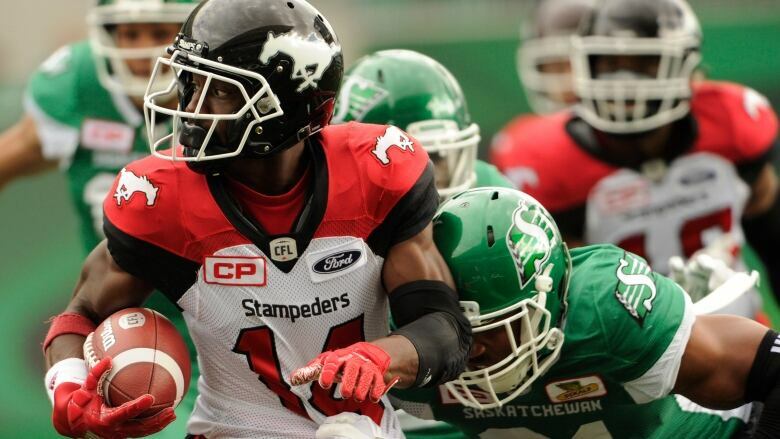 Davis had three sacks and Hughes had two as the Stampeders improved to 11-1-1 and clinched a playoff berth. They also set a CFL record for 16 consecutive wins against a divisional opponent. "Just to be clear, [Saskatchewan's] offence didn't struggle today," Hughes said. "We completely shut it down." Calgary's offence wasn't necessarily sparkling, but it consistently moved the ball thanks to running back Jerome Messam, who helped set up all five of Rene Paredes' field goals. Messam rushed for 127 yards on 23 carries. He wasn't a lock to play in this game after he suffered a vicious hit to his head the week previous. "He has been fighting it all yearâ€¦ he really wanted to play today," said Calgary head coach Dave Dickenson. "It was a game where a running back could have a decent game because they basically committed to taking away the pass. It was important for us to have that hammer inside and he played well." Saskatchewan quarterback Kevin Glenn, who sat out last week's game with a sore right (throwing) hand, returned to the starting lineup and was under pressure much of the game. He completed 12-of-19 pass attempts for 127 yards and was intercepted once. Trailing 15-2 midway through the fourth quarter, Brandon Bridge replaced Glenn and rallied the Riders. Bridge hooked up with Devon Bailey for a 14-yard touchdown to make it a six-point game with about five minutes remaining. The next time Bridge got his hands on the football, he marched the Riders into Calgary territory. That's when the Stampeders' defence made the game's biggest play. "They were driving pretty good later in the game when Bridge came into the game," Hughes said. "We knew we had to step it up and do something about it and we did and we shut them down." Davis again found his way to the quarterback and while he was taking Bridge to the turf he stripped the ball and recovered it to secure the victory. Calgary's Bo Levi Mitchell said his team's victory wasn't a flashy one, but still counted for an important two points nonetheless. "Saskatchewan plays very well at home and they play with momentum, their fans are into it all day," he said. "We did a heck of a job stopping that today. We didn't allow them to get rolling. It wasn't our biggest and best game, but we played smart, manageable football and pulled it out. "Stat-wise and touchdown-wise it might not be there today. Our all-stars aren't there and guys were stepping up and playing football." Mitchell completed 24-of-32 pass attempts for 222 yards. The Riders had won five of their previous seven games and a win on Sunday could have moved them into a tie for third place in the division. Nonetheless, the Riders are very much in a position to challenge for a post-season berth. "We're a playoff team right now," offered offensive lineman Derek Dennis. "The direction this team is going, people are starting to respect us as a football team. That might be the only win we could take away from this game. We wanted another W, but we'll get another crack at them in October."